I came, I SAW, I conquered. : Squad – Communicate. Coordinate. Conquer. 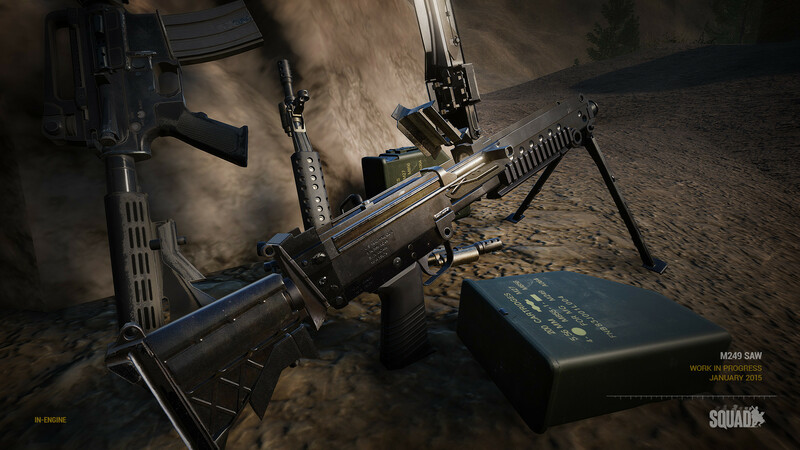 To celebrate the launch of our new website we wanted to show some off more progress in the art department, with the unveiling of our M249. When I first joined Squad, our weapons roadmap was in place and artists had weapons assigned to them. There were a few assets that were floating in limbo because no one had claimed them. 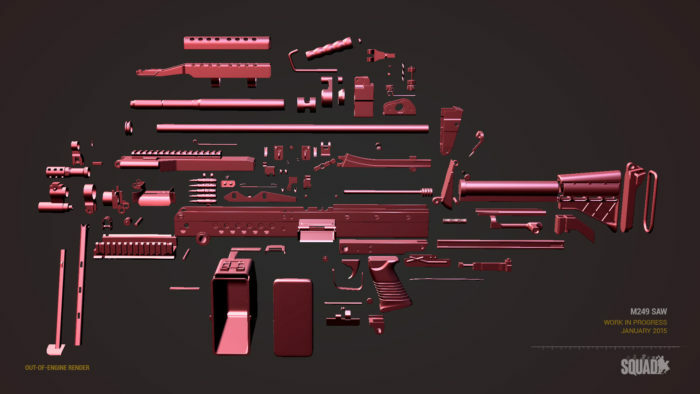 The M249 was one of them, I mean – how hard could it be? Having only a couple of hours a week, this project dragged on and on due to the graphics level we want to achieve. So weeks went by and objects seemed to appear from out of nowhere; the results of staring at pictures of a gun for hours on end. Many of the details of guns made for games are normally hidden away in concealed areas of the weapon, but with a belt fed machine guns you see the complicated interior when reloading. So why are we going though this extra trouble and effort when you were fine with what you had in Project Reality? 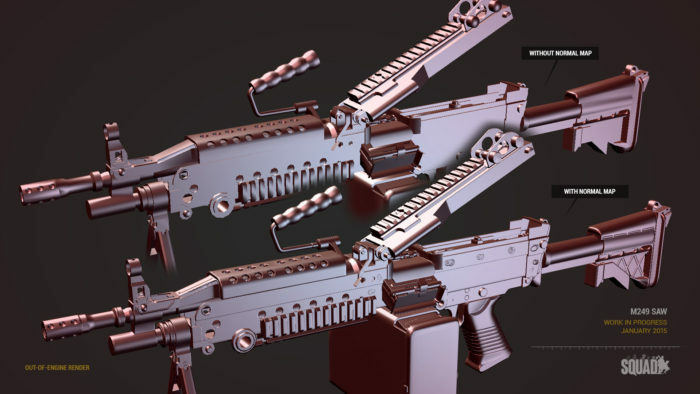 With the US military constantly upgrading equipment and components it can be hard to keep track of which buttstock is currently the one seeing the most use, and where and for which branches of the armed forces – and do all the other users of the FN MINIMI also use these components? What if we need to add these later? Or when we implement another faction, the weapon must be able to accept any other components that may differ from this particular version. The answer is that the weapons and assets we make are future proofed so that we don’t have to make awkward hack jobs or start from scratch, and most importantly keep things consistent. Planning and working this way is completely opposite of how Project Reality was done, and it is a joy for me to know that the assets we create are easy to build upon and alter when needed. Another part of this is that we are also making things feature-future proof. 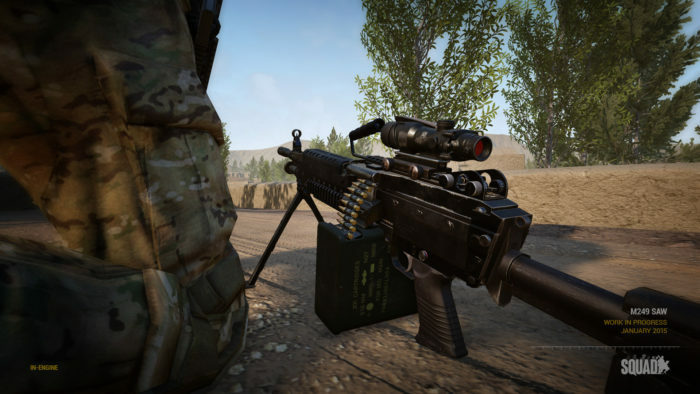 We are still deliberating the mechanics of machine guns in SQUAD and do not know if barrel switching will be a planned feature, but in the circumstance that it is, we need to be sure that our art has support for the additional functionality from the start. That meant that I had to make sure that it also has interior details visible when the barrel is removed. 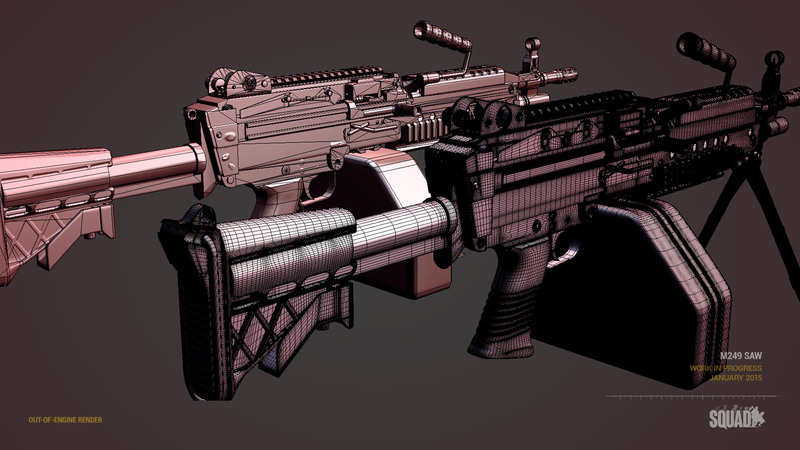 The same applies for the sights and various other parts of the weapon. Did I mention that it can also use a standard M4/M16 magazine instead of a belt of ammo? The last part that made this task difficult is you, the audience. You are not just any gamers out there, many of you know these guns intimately and many have even have fired the weapons. We need to make our art utterly believable to give our audience the most immersive experience possible. And lastly, there is a higher expectation of graphical fidelity than in the past, so we have to set a standard that is competitive with bigger titles. Enough about how hard it was! Lets now talk about how fun it was! We are no longer limited by last-gen shaders that barely can handle normal maps – special texture maps that can fake a lot of details on to a model by altering the lighting information of the models surface. Because we arent visually limited it means we can do some funky things this time around! So after completing several versions of the M249, I picked a combination of components that is most representative of the current version used by the US ARMY, with the exception of the ammo box. The big green 200 round box was simply the easiest to get in game first, so I took that first. Rest assured, you will see the remaining variations eventually. version of the weapon. This is a model optimized to give you the best performance in-game. When all is said and done the high poly model is around 6.000.000 triangles, and the ingame version is around 20.000 depending on the configuration. The number will decrease the further away you get from a guy with this gun, as we are creating distance-based levels of detail. A lot of technical and boring things now happen, and I will spare you with the details of this, but the result is that I can now put developers Bull and Chuc to work while I move on to my next project. Chuc will be taking up the task of animation the weapon. Chuc has been a long-time developer of the Battlefield 2 mod, most notable for his work as lead animator on the team. Chuc also takes up the task of exporting the model from our 3D modelling software into the Unreal 4 engine. 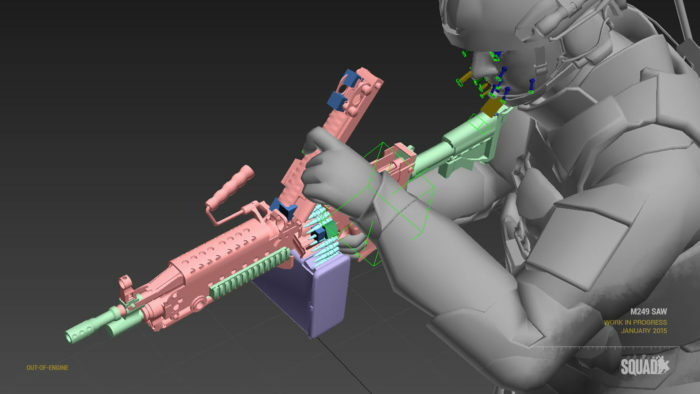 This process involves separating out the parts necessary for animation and scaling the weapon appropriate to the player model and real world measurements. After the export is complete we return to the 3D modeling program for animation. We used shared animations and skeletons for first and third person, so there’s the extra concern of getting the animation to a good state in both. Generally the workflow goes from animating the weapon first, then the hands, and finally the body and head rotations to add that final bit of polish. The most complex animation is the reload animation. It requires a several actions and complex hand poses; a machine gun reload often takes 3 to 4 times longer than any rifle or pistol animation. In addition, we have planned a number of different animations for different stances, so the amount of work is effectively doubled. Regardless, animation quality is one of our strengths. I want to thank my extremely talented teammates, Chuc and Bull for joining me on this crazy adventure, and we look forward to giving you some more insight into the things we do! Hope you enjoy it when you get your hands on it, or fear it when you are getting mowed down by it!